“A Pencil in Our Lords Hand” will be televised on EWTN, Catholic TV and Salt and Light in April. Father Joseph Walijewski’s Legacy Guild is an association of people dedicated to furthering the cause of the Servant of God Father Joseph Walijewski and providing continued support for the legacy he left behind. Padre Jose’s spirituality was rooted in seeing Christ crucified in everyone he met; especially the orphans, the abandoned, the marginalized and the poor. Unwilling to turn and walk away, Father Joe established parishes, soup kitchens and an orphanage to meet the basic needs of those most in need. The missionary zeal inspired by Fr. Joe’s legacy is passed on to us today. We are called to imitate Father Joe’s heroic virtue, and respond by embracing the people we encounter in our everyday lives. What can I do to help the Cause of Canonization of Father Joseph Walijewski? You can pray the special prayer for his canonization that simultaneously presents to God a request for healing or other special intention. 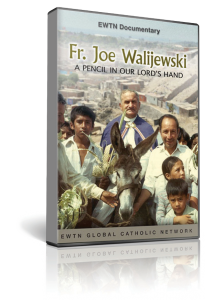 You can also share the story of Father Walijewski at your parish, prayer group, or Bible Study. Other ways you can help the Cause are to attend the various events sponsored by the Diocese of La Crosse for the promotion of the Cause, or to make a donation.